Preheat oven to 350°F. 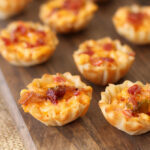 Fill each mini fillo shell with 1 teaspoon pimento cheese. Drizzle with about 1/2 teaspoon of the melted pepper jelly. Sprinkle about 1 teaspoon of the bacon crumbles over the top each.